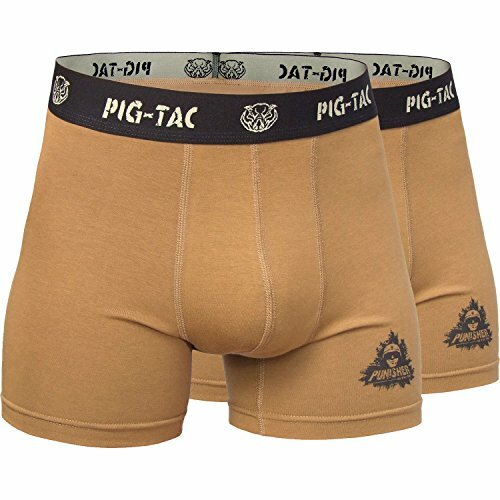 Anatomical cut underwear for military servicemen and for people that value comfort and reliability. Punisher Combat Boxers "PCB" is made of high-quality natural material "CSSJF-30/1" (95% cotton, 5% spandex, 190g/m­²). Material provides wearing comfort of "PCB" both in the hot and cold time of the year. additionalpressure in the waist zone and ensures tight fit. Punisher Combat Boxers are created by specialists of 281Z Development Group*. equipment enchancement program of Ukrainian Armed Forces from 2015 to 2016. From 2016 to 2018 281Z Development Group cooperated with the popular Ukrainian military brand. All products, that were developed by 281Z are thoroughly tested in field active conditions and have proven their quality in combat. Material provides wearing comfort of Boxers both in the hot and cold time of the year. Wide elastic belt does not create additional pressure in the waist zone and ensures tight fit. Main fabric does also stretch to ensure the best fit in the right places, but does it softly without creating excess pressure. Punisher Combat Boxers "PCB" comes in environmentally friendly packaging. Label without tags. Machine wash, permanent press: initial water temperature should not exceed 40C/105F. Iron medium, max temp. 150C/302F. DO NOT: Dry clean, Bleach, Tumble dry. Made in Ukraine. Quality proved in combat. If you have any questions about this product by 281Z, contact us by completing and submitting the form below. If you are looking for a specif part number, please include it with your message.